22 October 2017 - We are currently operating at a 7-10 day turnaround time. Trading since 2000 we consider ourselves to be the original and the unrivalled negative and slide scanning service on the internet. We have been trading for nearly 15 years and have a stream of satisfied customers. Many of which have taken the time to email us their feedback. Feel free to read some here. This whole photographic journey began rather tragically. When my grandmother passed away in the late 90's we were going through her house. We discovered a mountain of 35mm slides in the loft. 30 years of photographic memories stored in a box that nobody knew anything about. After we had converted this collection to a digital DVD format and shared the images with the family it occurred to me that there must be many families with similar collections gathering dust. Slides on DVD was then born. Many people we speak with on a day to day basis do not even realise that it is now possible to convert their slides, negatives or video tapes to a digital format. Our slide and negative scanning service will enable you to view your 35mm slides and 35mm negative images at the touch of a button. After we have scanned your slides we give you a CD free of charge for use on a PC. We can also produce DVD slideshows that you can watch in high quality on your TV. We can even place your slideshow to music. 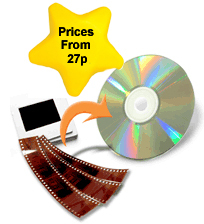 Our video conversion service will enable you to watch your VHS, HI8 or 8mm camcorder videos on your DVD player at the push of a button. Is there really a better gift for an elderly relative or even a 30th birthday present for your grown up child? Slides on DVD even offer a Gift Voucher Service that is ground breaking in our industry. Please View HERE. We feel that you will be incredibly satisfied with our service. Our previous customers can't be wrong. Therefore we are offering a free trial service. You send us up to 4 x 35mm slides or negatives and we will scan them and email you the results. © Copyright 2016 - Slides on DVD. All Rights Reserved.